The Arrawarra house is located on a large beachfront block north of Corindi – with the tidal Arrawarra Creek dividing the site between vegetated frontal dune and adjacent coastal heath. The selected site is required to be 100m back from the Arrawarra Creek and separated from existing natural heath by a clear firebreak buffer. A well established walking track leads to a footbridge across the creek and frontal dune, a total distance of 250m to the open beach. The house design is based upon a two storey cruciform plan with accommodation for the client’s extended family, and provision for future listing on the air B&B network. Beach-front location and close proximity to the national highway are ideal. The cruciform plan in effect provides north, south, east and west-oriented pavilions on two levels, and rooms are designed to take maximum advantage of each pavilion’s orientation. All living areas, and most bedrooms open to a wide verandah which in turn provides access to the surrounding landscaped area. 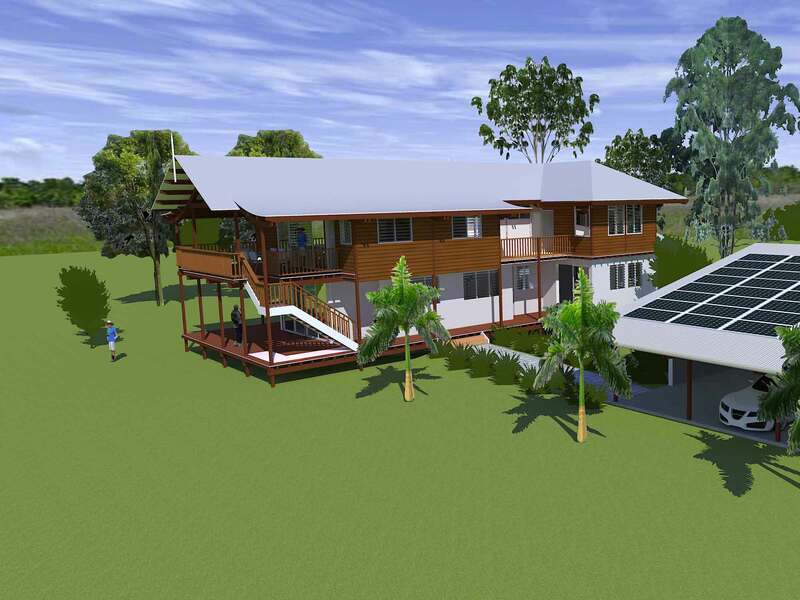 The house is designed to be energy efficient, with stand-alone solar power generation and effluent disposal systems. Provision has been made to locate the house above 1:100 year projections for coastal flooding and inundation.